The federal government developed Greendale in 1936 as part of the Resettlement Administration’s (RA) Greenbelt Towns Program. Some historians, such as Paul Conkin, consider the greenbelt communities built under this program to be one of the most innovative New Deal initiatives. Resettlement Administration head Rexford Guy Tugwell is credited with the idea for these towns. He intended construction to provide jobs for unemployed workers and their design and development to provide the best of country and city living and homes at reasonable rents. The greenbelt towns differed from other New Deal housing programs because they were outside cities; involved extensive acreage; and were complete community developments. In addition to Greendale, the RA built two other greenbelt towns: Greenhills outside Cincinnati and Greenbelt outside Washington D.C.
Elbert Peets, assisted by Jacob Crane, headed the Greendale planning group; the principal architects were Walter G. Thomas and Harry H. Bentley. Greendale’s design focused on the total community, not simply a collection of individual buildings and houses. Greendale opened to 572 families in 1938 with an assortment of single family homes, multi-family homes and row houses, as well as civic and community buildings, a school, shops, and a well-planned infrastructure of roads, walking trails, PARKS, and utilities. Made of cincrete, a type of cinder block, the homes were unique for their small setbacks from the street and the orientation of the living room at the back of the homes, allowing residents to view the extended green space behind their homes. Based on a modified “garden city” model, the site plan followed a conventional grid layout, with many residential streets only one to three blocks long and terminating in vehicular dead-ends. A network of off-street walking trails connected these streets to each other and to the village center. Residents could reach the village center from their home by crossing only one traffic circulation street or reach a park or playground without crossing a single street. Along the major north-south axis known as Broad Street, the village center was the focal point of Greendale, with shops along one side and the administration building (now known as the village hall) at the north end. The planners wanted the town center to be more than the usual commercial store center but also a gathering place and focus of the cultural and civic life of the town. The school/library building, fire and police stations, and administration center, which also doubled as a meeting place for community organizations in the evening and as a church on weekends, were also located in the village center. Greendale’s early years were known for its cooperative organizations and services and a high level of community volunteering. The Greendale Co-operative Association ran many of the retail stores, including a food co-op and gasoline service station. Residents as well as the Resettlement Administration were enthusiastic about the level of consumer cooperativism. Because of the difficult access to Milwaukee, the families’ modest incomes, and the general state of the DEPRESSION economy, the co-operatives allowed Greendale residents to purchase goods and gain services that they might not otherwise been able to, given cost and availability. Early Greendale’s grassroots democracy not only directed socio-economic cooperation but also provided the normal services of an independent municipality. While the federal government was their landlord, residents held the keys to local political power through the charters of incorporation. Greendale incorporated in 1938 shortly after opening to residents. In addition to income limits ranging from $1200 to $2700 depending upon family size, initial residents went through a rigorous selection process. The Resettlement Administration accepted families who demonstrated positive attitudes towards community life and participation. Most were families with children, although a few young married couples resided in the one-bedroom (“honeymoon”) apartments. Capitulating to local demands, the Resettlement Administration imposed an inflexible selection rule involving race: only white residents. 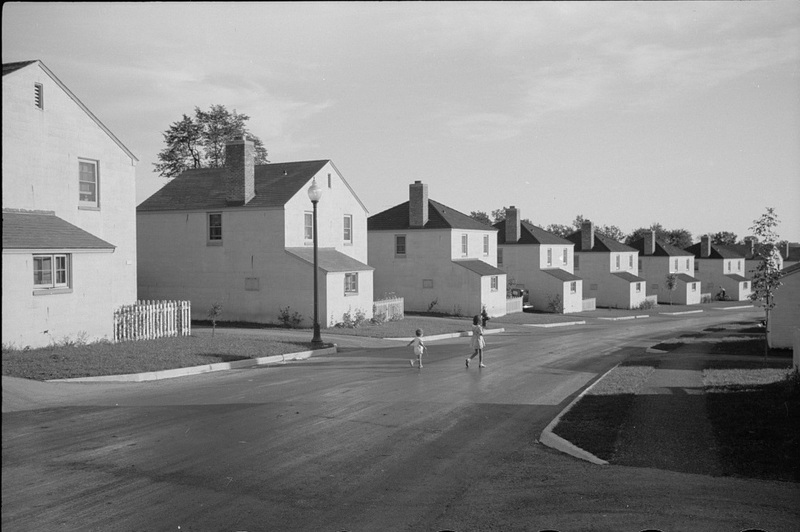 In 1949, the federal government decided to divest the town and offered Greendale residents the right to purchase their homes. Fearing that the unique greenbelt plan might be ruined if the town fell into the hands of real estate speculators, Milwaukee mayor FRANK ZEIDLER encouraged a group of four leading Milwaukee businessmen to form the Milwaukee Community Development Corporation, which bought the undeveloped land, village stores, and public buildings. They hired Elbert Peets to devise a master plan, building upon his original ideas for Greendale. The transfer of ownership from the federal government was completed by the end of 1952. Residential development in Greendale grew in the 1960s and early 1970s, following many of the elements of Peets’ master plan. The town still has sizeable acreage of parks and greenbelts, along the now Milwaukee County-owned Root River Parkway. However, Peets probably did not envision Wisconsin’s largest regional shopping mall being built in Greendale. Southridge Mall opened in 1970 along Greendale’s northern border. Facing this market competition as well as other economic changes in retail delivery, the stores and services in the village center slowly deteriorated, with nearly three quarters vacant during the early 1990s. The family foundation Grandhaven LLC undertook revitalization of the village center in the late 1990s. Greendale resident Roy Reiman, whose successful and prominent PUBLISHING firm was also located in the town, spearheaded the effort. After this reinvestment, the village center became a vibrant place of stores, services, events, and local government services. Greendalers speak of it as the “heart” of their community. The village center area is listed in the National and State Registers of Historic Places and is a National Historic Landmark. ^ P.K. Conkin, Tomorrow a New World: The New Deal Community Program (Ithaca, NY: Cornell University Press, 1959). ^ Hal Prey, ed., Greendale: The Little Village That Could… and Did (Greendale, WI: Reiman Media Group, Inc., 2004). 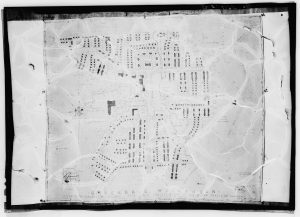 ^ “The Planned Community of Greendale, Wisconsin–Image Gallery Essay: A Greenbelt Town,” Wisconsin Historical Society, last accessed January 6, 2015. ^ “U.S. Government Building a Communist Town,” Chicago American, October 26, 1936. Alanen, Arnold R., and Joseph A. Eden. Main Street Ready-Made. Madison, WI: The State Historical Society of Wisconsin, 1987. Arnold, Joseph L. The New Deal in the Suburbs. Columbus, OH: Ohio State University Press, 1971. Christensen, Carol A. “Greendale and the Greenbelt Program” in The American Garden City and the New Towns Movement, edited by Carol A. Christensen, 71-94. Ann Arbor, MI: UMI Research Press, 1986. Mayer, Albert. Greenbelt Towns Revisited. Washington DC: Department of Housing and Urban Development 1968. Prey, Hal. Greendale: The Little Village That Could… and Did. Greendale, WI: Reiman Media Group, 2004.